This past weekend, we cleaned our apartment. And I mean, REALLY cleaned our apartment. We unpacked our last boxes and re-arranged some furniture. Everything seems more tidy and more manageable, and I just feel less stressed. One area that still needs a little work is Hannah's toy mountain which, while trying to be maintained in one area of our living room, erupts in a fashion that leads into our dining room and dangerously close to our kitchen. ToddlerTrunk was created to address this specific issue. ToddlerTrunk provides a way to buy and sell gently used children’s items, but it is targeted to moms and dads, so everyone on the site is looking to buy or sell children’s stuff. The items are organized by type, gender, and age, making it easy to find the toys, clothes, or furniture you need. Much better than throwing these items in the garbage, harming the planet. Plus, you can exchange things you are looking for, since we all know children's needs and wants are constantly evolving. 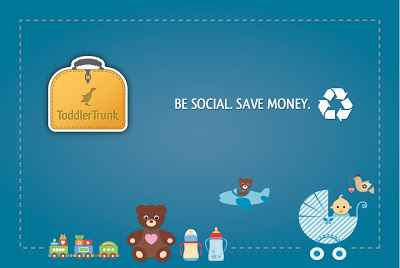 Unlike other re-sale sites, ToddlerTrunk tries to put a face on everyone’s profile to create a community of parents in your area. Users have the option of signing into the site with their Facebook or Twitter accounts, so you have a better chance of knowing if the seller or the buyer is a friend, a neighbour, or an acquaintance. ToddlerTrunk has gently used items as well as new and handmade items. Users can also give items away for free in exchange for Rubies. One Ruby has a value of $10.00. When a user joins, they receive five free Rubies. Users also earn Rubies by signing into the site and posting items. ToddlerTrunk is currently available in Toronto, Vancouver, Edmonton and Calgary. For the latest, make sure to follow ToddlerTrunk on Twitter and like them on Facebook. Now, I must go earn some Rubies...and search for other items to pile on toy mountain. ToddlerTrunk makes posting unwanted items a breeze...and it's easy to find new things I (er, my daughter) wants. What do you do with stuff your kids have outgrown?